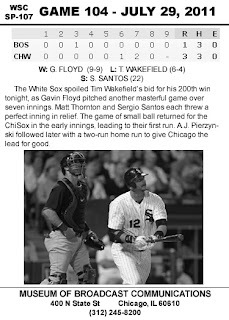 I'll admit that I don't remember too much about Brook Fordyce on the White Sox. 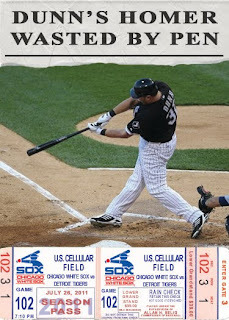 I do remember that he had a mini radio show on one of the AM sports radio stations when he was with the White Sox. 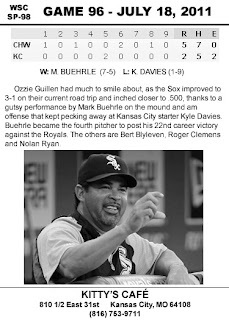 I do remember having a strong opinion about him (I liked him on the Sox), but for the life of me, I can't recall any single memory of his playing days. I'm guessing that Mark Johnson and Charles Johnson (no relation) took away most of those memories. 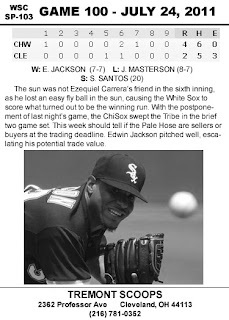 In fact, I was probably blinded by the fact that Harold Baines came back to the Sox, along with his replacement Charles Johnson, that Fordyce was just a distant but pleasant memory buried in the nooks and crannies of my mind. This is one of the reasons why I enjoy collecting cards. It jogs my memory. Players that I liked, but were only a blip on my radar, can instantly be remembered, even if those memories aren't so clear. 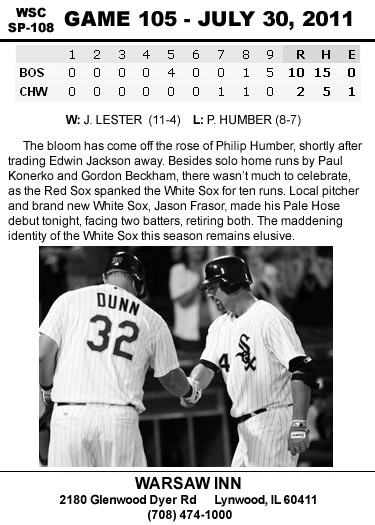 I remember Brook Fordyce over such catchers as Chad Kreuter and Charlie O'Brien and Robert Machado. I suppose that's the important thing. Pleasant, fuzzy memories can be a good thing. Someday, they may coax a better memory. This has been sitting on my desk since the weekend, but I've been a little under the weather since then, so excuse my lateness. 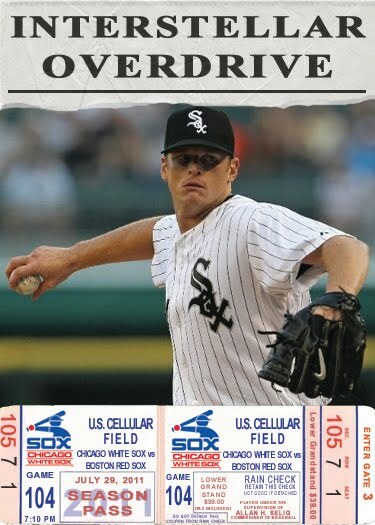 Before any more time slipped by, I wanted to thank Morgan for sending me a few White Sox cards. Ranging from 1992 to 2011, most were pesky thorns in my side that just didn't make the journey to my collection... until now. 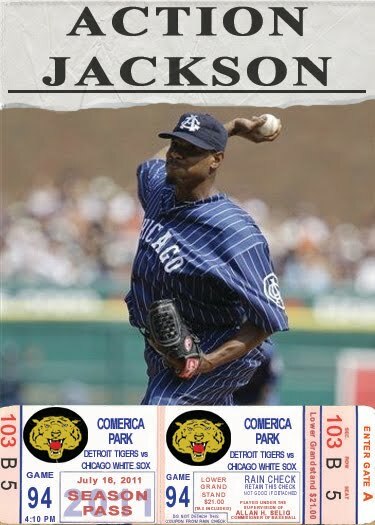 The most interesting card of the lot would have to be the 1992 National Convention promo of Frank Thomas for a magazine called Profiles In Sports. 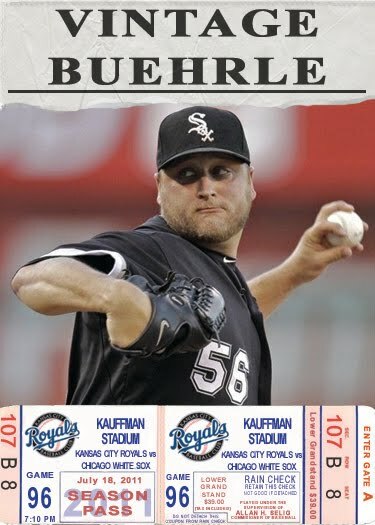 Honestly, I don't remember ever seeing the magazine, but a little online search produced images of Nolan Ryan and Mickey Mantle as other cards offered in the promotion. The scanner doesn't do the card justice. That pale yellow color that dominates the card is actually a blinding rainbow of foil colors in even the dimmest light. It's a nice precursor to the shiny rainbow foil explosion that would happen just a few short years later. Thanks, Morgan! The cards you sent over were great! I'm hoping to drop off your package at the post office tomorrow. I think you'll be happy with what you find in there. 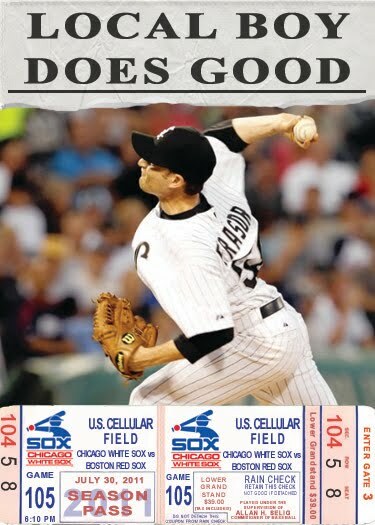 I've been lobbying for years for the White Sox to pick up Jason Frasor and it's finally happened. 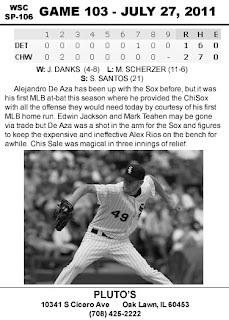 The Sox traded for Jay and starter Zach Stewart from the Toronto Blue Jays and part with Edwin Jackson and Mark Teahen. 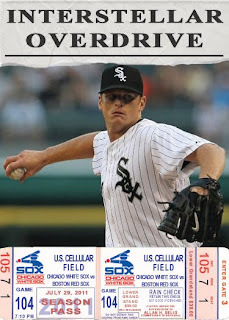 I'm one of the few White Sox fans who liked Teahen. He is a great guy and very funny, but he is overpaid for what he does and his style of play is very frustrating. Edwin Jackson is also a great guy and can go deep into games. The downside was a high pitch total and the potential for derailment at any time. The most annoying part is that they could have been so much more with a little consistency. Alejandro De Aza was called up and is starting in center field today. This should help stabalize the outfield a little more. 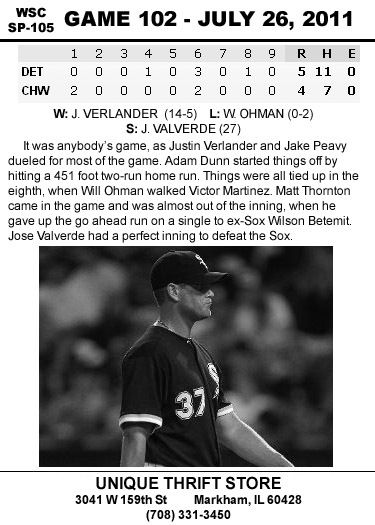 Teahen was a nightmare in the outfield and no picnic at the corner infield positions. This is definitely an upgrade. 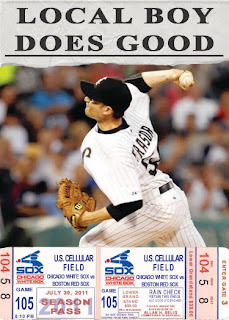 Jason Frasor is a hard thrower, who knows how to get batters out. He should fit right in with what the ideal Sox bullpen should be. Welcome to the White Sox, Jay! I'd say you'd love it here, but growing up in the south suburbs, you already know that. 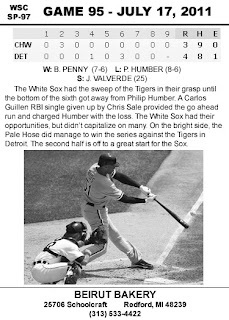 When I was a kid, I devoured any statistical information I could about baseball. I was enamored with records being broken and the odd little things that always seem to pop up in the sport. With that ravenous appetite for math, it's hard to believe that it was my worst subject. By 1985, I was into cards collecting for my third season. The 1985 sets were ones that I obsessively collected. 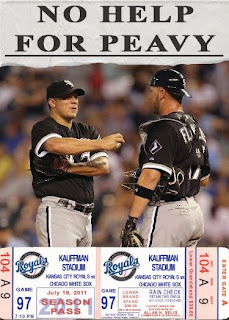 Topps and Fleer were the ones that I bought regularly. 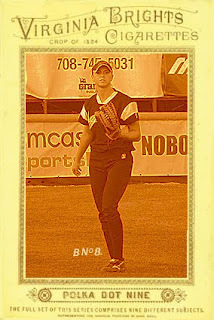 For some odd reason, I could never find a pack of Donruss in the mid-eighties. I gobbled up cards, stickers, rub-downs... anything that had baseball players on it, I bought. 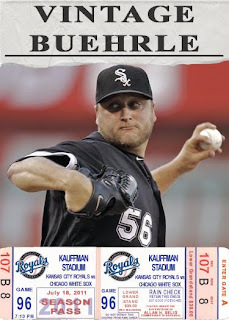 I even purchased a few packs of Topps 3-D, but could't figure out what to do with them. They always got ruined, so I think I stopped at three packs. Fleer and Topps always provided a thrill when opening a pack. I loved the special cards of Fleer and I loved the subsets in Topps. Topps was especially ripe with subsets in 1985. I can remember being thrilled each time I got a Father/Son or a Draft Pick card. It started an appreciation of Shawn Abner, that I still cannot explain fully to this day. I've brought out my love of Shawn Abner before, or should I say, Johann Gambolputty de von Ausfern-schplenden-schlitter-crasscrenbon-fried-digger-dingle-dangle-dongle-dungle-burstein-von-knacker-thrasher-apple-banger-horowitz-ticolensic-grander-knotty-spelltinkle-grandlich-grumblemeyer-spelterwasser-kurstlich-himbleeisen-bahnwagen-gutenabend-bitte-ein- nürnburger-bratwustle-gerspurten-mitz-weimache-luber-hundsfut-gumberaber-shönedanker-kalbsfleisch-mittler-aucher von Hautkopft of Ulm. The cards that combines all of my interests were the Record Breaker cards in the 1985 Topps set. I would study each one for what seemed like hours. 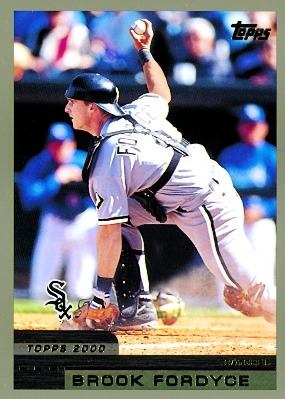 Sure, I loved the Fisk card. It was a huge commodity around my neighborhood. 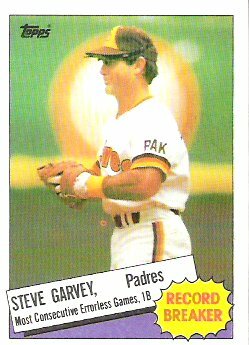 The card that captured my attention more than any other of that subset was Steve Garvey. 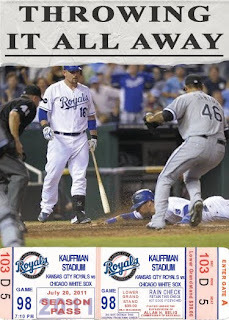 Yes, an errorless streak is impressive, but I was more concerned with how the front of the card looked. 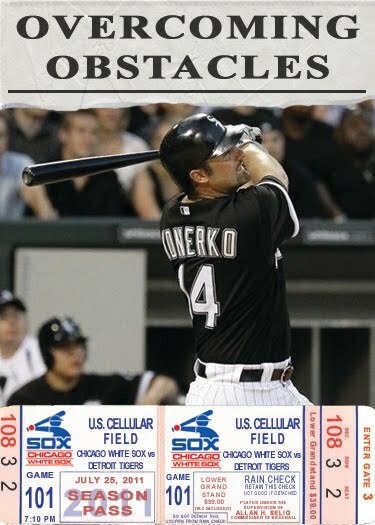 I know know that the background is from inside the stadium, but as a kid, I could never figure out what the blurred object was in the background. That blob fascinated me to no end. At first glance, it looked like the setting sun was behind Steve Garvey. The yellow, brown an orange color scheme on the uniform just seemed to reinforce that glance. My imagination back then was limitless and this card will always remind me of that. 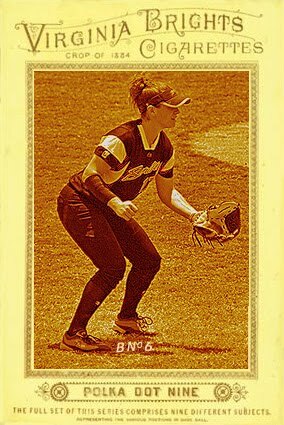 Most people see a card that with a slightly out of focus picture, with a fantastic player, just standing there, who accomplished an amazing feat, but I see the innocence of my youth and the unimaginable amount of possibilities that were ahead. 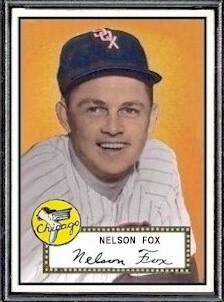 Do you want to win a free 1952 Topps style Nellie Fox card? 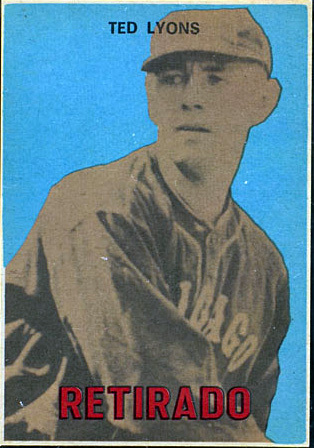 Click here and identify a player by answering a few questions about the 1952 Topps set. Good luck. We're all counting on you. 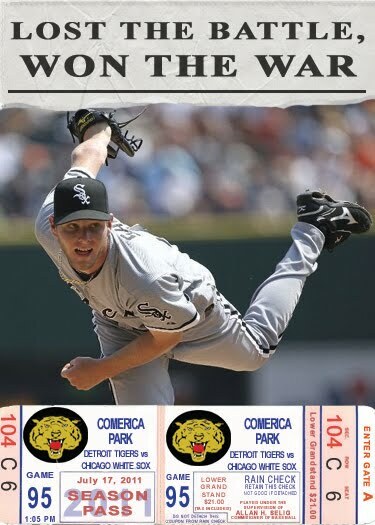 In my quest to see an example of every White Sox card, I run into some strange sights. The more I try to understand the mentality of some releases, the more I get confused. Just when I think I have everything figured out, something that shouldn't be appears. 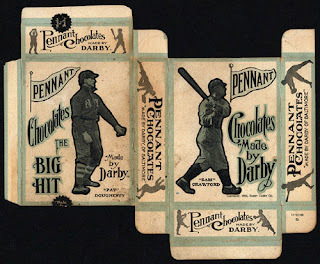 While researching the 1910 E271 Darby Chocolates set, I noticed that Patsy Dougherty had a card. 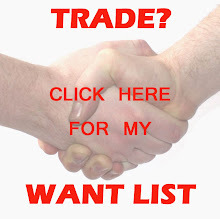 Through internet research, I found an expired auction for the uncut card. There was "Pat", as he was called on the card, in all his glory. I could add another one to the list. Upon closer inspection, I noticed Patsy wearing a New York Highlanders uniform. What makes this especially odd is that Dougherty last played for New York in the middle of the 1906 season. Ever since then, he had been with the Chicago White Sox. 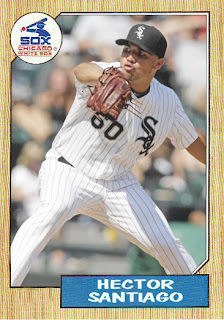 In fact, in most candy sets, Patsy Dougherty is the only White Sox player to have a card. This left me puzzled. It's not like I can get in my time machine and ask someone from 1910 why this is. Then, I discovered this ad from 1906. No, it has nothing to do with the cards or 1910. Instead, it lists the company address as in Baltimore, Maryland. This would lead me to believe that either the date on the candy is wrong or the company has an east coast bias, like ESPN. Under closer inspection, I didn't need to look any further than the box. It mentions Baltimore and on the Sam Crawford side there is a 1910 copyright date. I guess I'll chalk it up to wanting regional players on their packaging to sell more chocolates. Still, it's curious that the company would use a player who only played the equivalent of two seasons with the Highlanders. Could it be because he made his home in New York state? The world may never know. Back in the nineteenth century, when the original cards were made, there was no such thing as a designated hitter. Times have changed and no matter how you feel about the position, it has been adopted in official baseball and softball games alike. The Chicago Bandits do use the position in their game, so there will be an additional card. It throws the "nine" part off slightly, but that's progress. 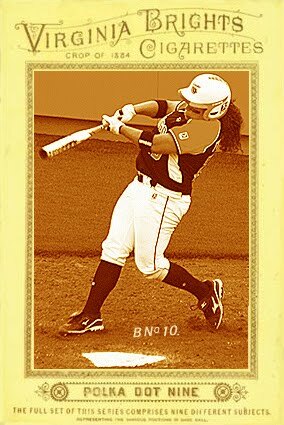 Position number ten, designated hitter. 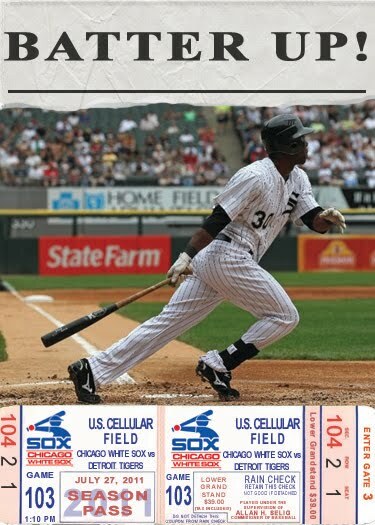 There are many Topps issues that you don't hear much about. 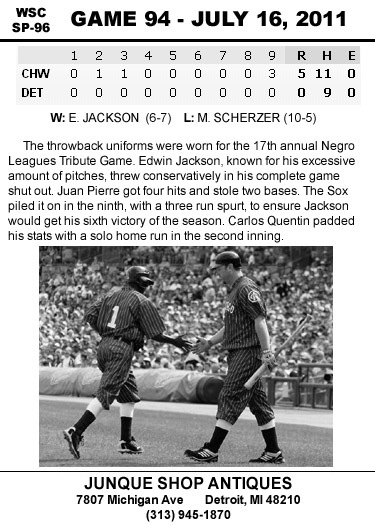 As far as their revisionist history goes, there was nothing before the iconic 1952 set. Sometimes that blue backs and red backs of 1951 will get a little love, but it's pretty rare. Rarer still? The Connie Mack All-Stars set. Serious collectors have heard of this set, but the casual collector will be left scratching their heads. It has similarities to the more well known to the blue back and red back cards. They both have black and white photographs and solid color backgrounds. That's where the similarity ends. The card towers over the regular Topps 1951 set at 2 1/4 x 5 1/4 inches. 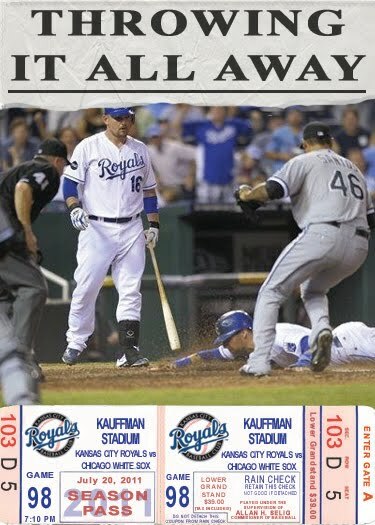 Topps and other companies would go back to this idea numerous times over the years. 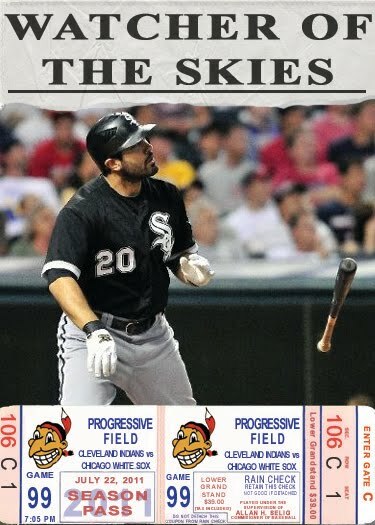 This set was a precursor to the Donruss All-Star Pop-Up set, among others. 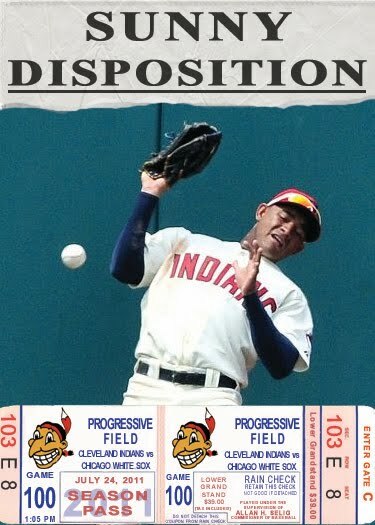 More collectors are familiar with the Donruss set than this one, but the principle is the same. The player could be popped out of the background and be ready for some 2-D action! Maybe I just discovered why these types of sets don't get made each year. How many people want to have a pop out baseball player? These were fun, when I was a kid, but with all the technology today, I could see kids getting bored very quickly. This is a nice pick up, if you can find one. It just goes to show that no matter how much Topps wants us to believe everything started with the 1952 set, there will always be a few practice sets lurking in the shadows. Position number nine, right field. Position number eight, center field. Santiago was selected in the 30th round of the 2006 amateur draft by the White Sox. He made a slow climb up the ranks, landing in AA Birmingham for the first time in 2011. Once there, he was plucked onto the parent team. 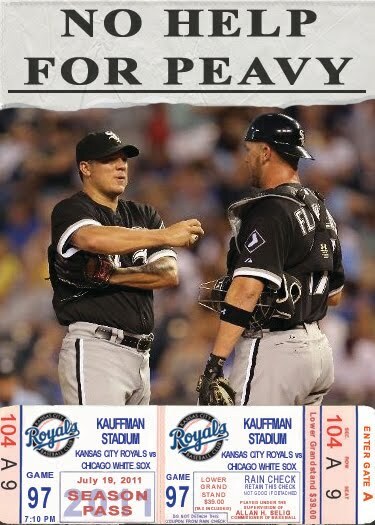 Hector was called up to replace John Danks on the roster. 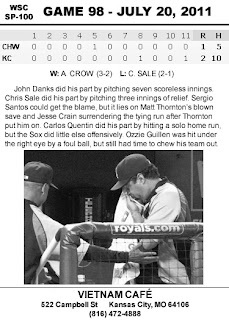 Santiago made his MLB debut on July 6, 2011 against the Kansas City Royals. 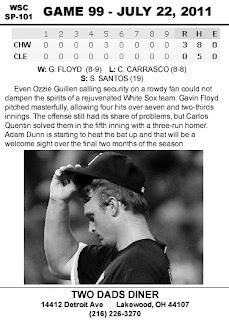 He pitched a perfect ninth inning. 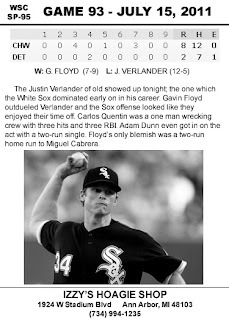 The next day, he came into the game, against the Minnesota Twins, with two out in the fourth inning. 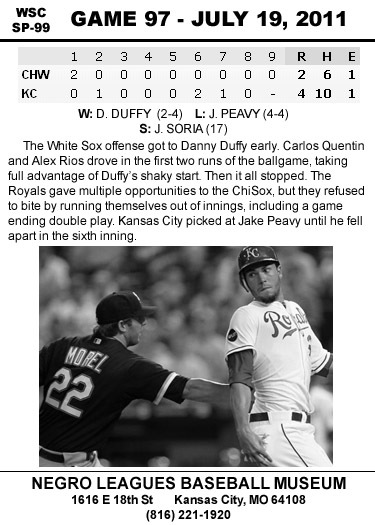 Philip Humber had a rare bad outing and Santiago stepped in to mop up. 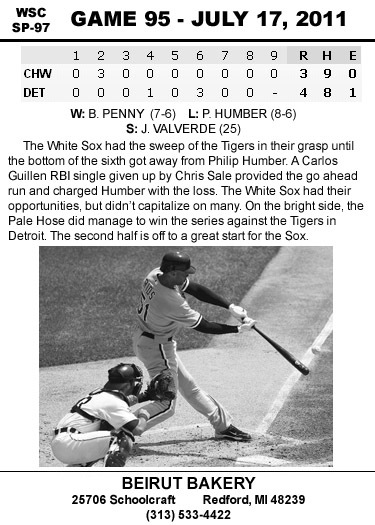 Hector gave up one hit and one walk over four and a third innings. When Danks returned from the DL, Hector was sent back to AA. While he was up with the Sox, everyone raved about his command, so expect Santiago to be called back up, if needed. Position number seven, left field. I can hear the first thought in your head. "Oil Can was on the Red Sox, not the White Sox, you idiot", would be my guess. And that's where you and your thoughts would be wrong. Dennis was selected in the sixteenth round of the 1980 amateur draft by the Red Sox. He made his debut with Boston in 1982 and went on to great success, winning forty-three games in a three year span. Things went downhill after 1986 and found himself finishing his MLB time with the Montreal Expos in 1990 and 91 and the Texas Rangers in 1991. 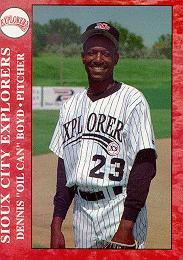 Boyd went off the radar for a couple years, but found himself pitching again in the Mexican League in 1993. When the strike happened in 1994, the World Series wasn't played for the first time since 1904. The 1995 season was in jeopardy and the owners had to put some type of product on the field. 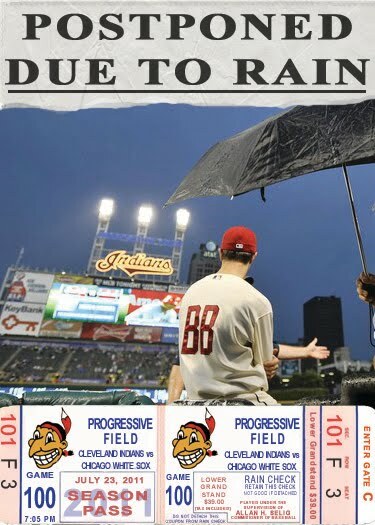 Each club raided their minor leagues and relied on former MLB players and something that resembled the recruiting process in the movie Major League. Oil Can stepped up and became the most vocal replacement player and in turn became the face of the entire movement. 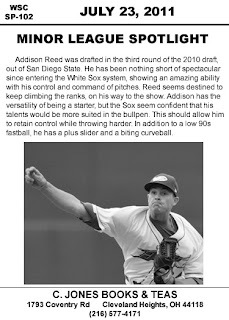 The White Sox signed him to a contract and he was the star player of the replacement team, which came within days of playing actual MLB games. 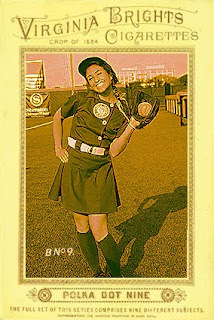 Judge Sonia Sotomayor ruled in the players favor and the regular players started the shortened season. 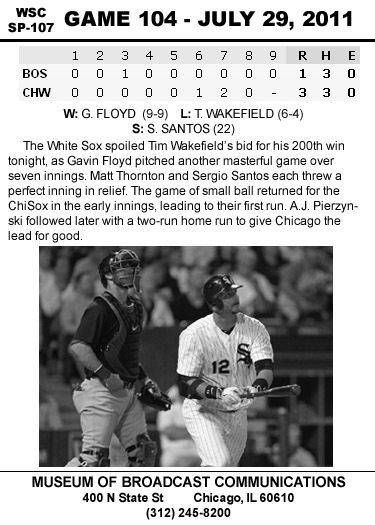 Shortly after the White Sox stint, Oil Can went back to the Sioux City Explorers. He bounced around the minors until 1997, but pitched again in 2005 for the Brockton Rox, in an attempt to make it back to the majors. He announced his intentions to return to the majors again in 2009, but found no suitors. "To be honest, I hate where Major League Baseball has gone," said Boyd. "It's so straight-laced and business orientated. 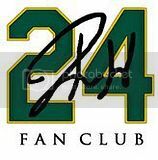 There's no interaction with the fans; no joy and passion and excitement. I might be old, I might be odd, I might be a strange story at first glance, but any team that takes a shot on me will find someone who's doing it for the right reasons. For the love of the game." 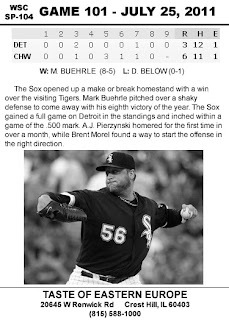 Back in October 2010, I voiced my frustration about a then months long roadblock on getting a picture corrected on baseball-reference.com. After pointing the error out, explaining the circumstances, and providing the correct picture, and still getting nowhere, I figured airing out the laundry in a public forum was the next logical step. 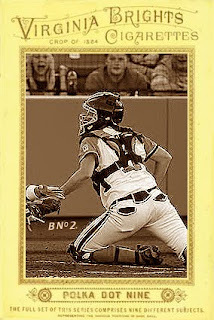 The error was spotted through a study of baseball cards and a passion for cup of coffee players. 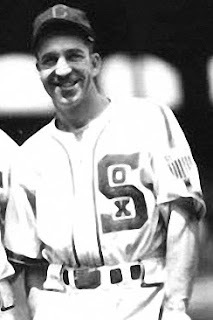 I was researching war time players from the WWII era and came across a picture of Roy Schalk, a second baseman who played for the White Sox in 1944 and 1945. 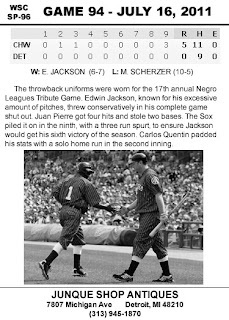 His only other MLB experience was in 1932, with the Yankees. In the picture I found, Roy looks thrilled to be back in the majors with the distinctive arches of Comiskey Park behind him. The trouble was that the picture being used on Roy's page was of Hall of Fame catcher Ray Schalk, who is not any relation to Roy. The error stemmed from a 1936 World Wide Gum card of Ray Schalk that was listed as Roy Schalk on the front of the cards. Just looking at the back of the card revealed that the card was of Ray Schalk, the Hall of Fame catcher who was manager of the Buffalo Bisons from 1932 - 1937. It was an honest mistake, but one that was never corrected. Simply looking at the back of the card would have clarified any mistakes from the front, but most people don't scan the back of baseball cards on any regular basis. Today, I was informed by Phungo that baseball-reference did a massive update to the photos, adding many missing pictures and correcting mistakes. I checked out Roy's page and am happy to report that the picture has been corrected. I consider it a victory. I understand that maintaining a site like baseball-reference can be daunting, even with a dedicated team, but I'm curious as to why it took a year to correct. 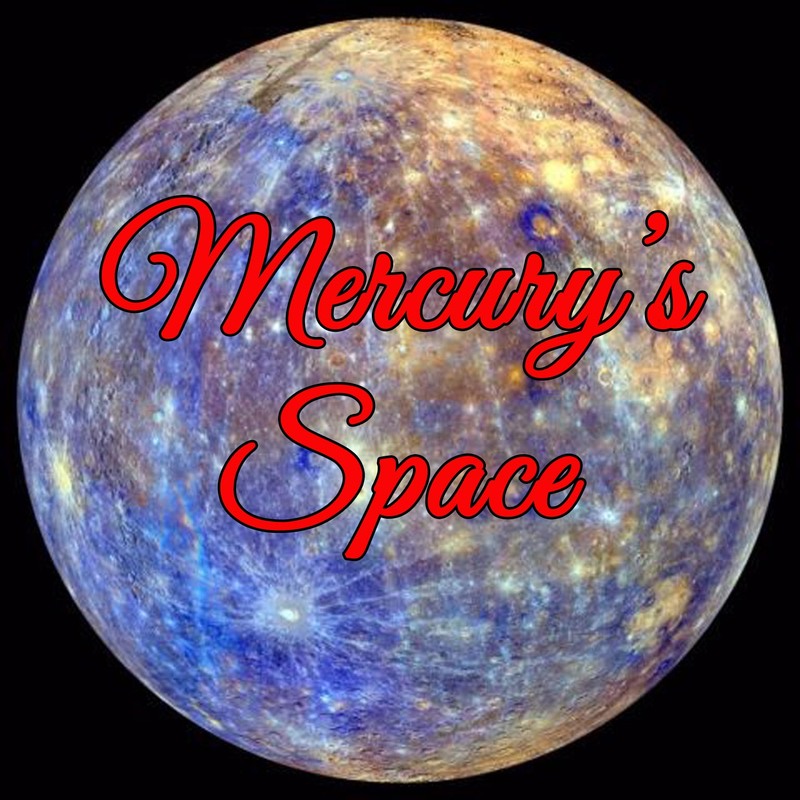 I think I should stop asking questions and just be grateful that the update is even there. I won't hesitate to send in more photos that need adding or correcting. I'll just know now to expect Brian Wilson's beard to be at his knees before I may see the results. To the person who finally put the update through, thanks. Position number five, third base. Position number four, second base. Position number three, first base. Part of the reason that MLB has such an influx of players from Latin America is that Topps issued baseball card sets in Venezuela for many years. Some would be virtual clones of that year's existing set. Others would feature Venezuelan teams. In 1967, Topps took that a step further. 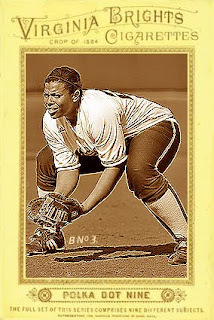 The middle series of the Venezuelan 1967 series featured retired players. 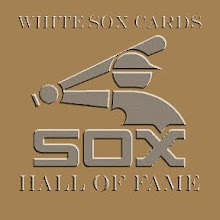 With a focus on Hall of Fame players and local interests, the Retirado set is perhaps the most unique set of the sixties. It's impossible to find one of these cards in gem mint condition. A lower print run is a factor, but the most obvious cause of the lower condition is that these cards were regularly pasted into albums. They were also issued in a non-English speaking country over a thousand miles away from the United States. 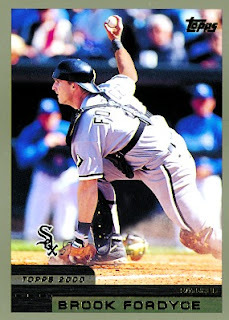 Despite the low grade quality of the design and color choice, there is an odd appeal to the card. 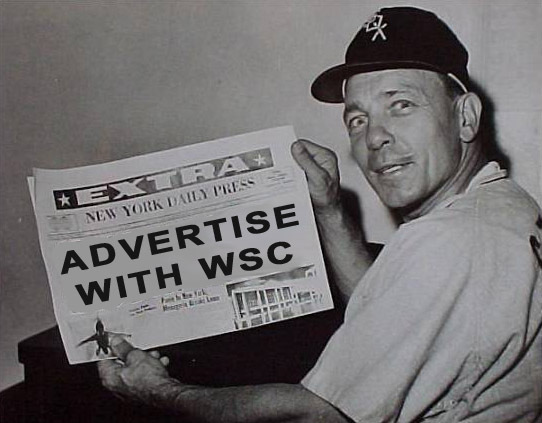 The picture of Ted Lyons reminds me of an old newspaper photo. The bright blue background is an odd choice against the cut out photo. 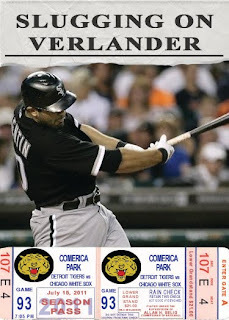 The "Retirado" label at the bottom is reminiscent of the 1967 Topps design, but the player name looks out of place among the other elements. The color choices remind me of older 3D glasses. I'm half expecting Ted Lyons to jump off of the card in an unconvincing way. 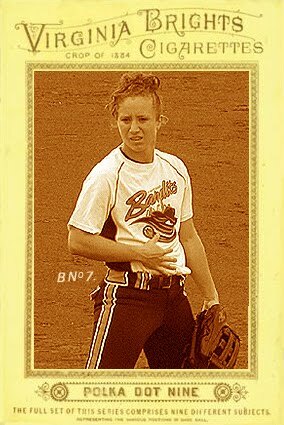 I love running across oddball cards like this. The chance of me ever owning one are slim to none, but I can still admire it from afar. 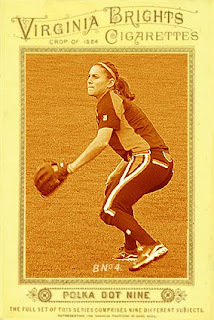 New Allen & Ginter may be all the rage, but let's bring out an old forgotten A&G set into its rightful place. 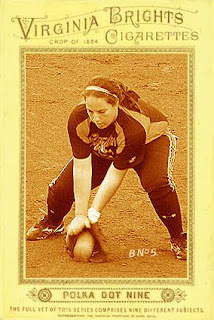 Position number two, the catcher. 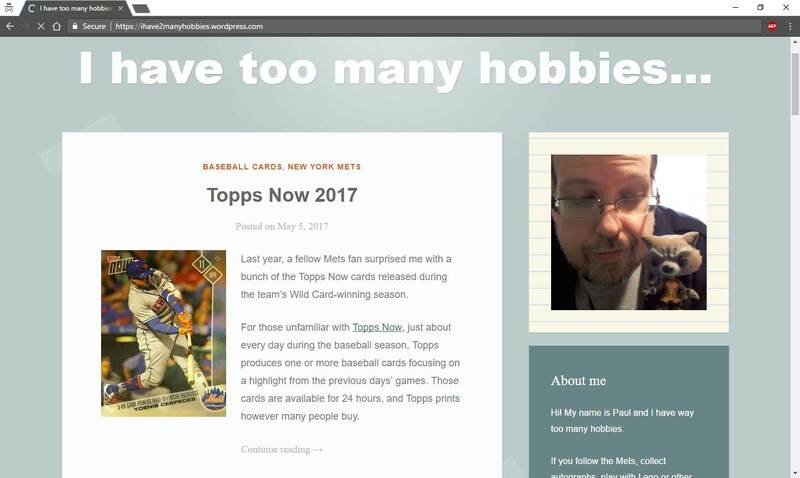 I Wonder Where Topps Hails From?